Computed Tomography (CT) Scanning, also known as industrial CAT scanning, is based on radiographic technology, which provides an ideal testing technique in order to locate and measure volumetric detail in three dimensions. The ability of x-ray to penetrate through varying densities allows CT inspection results to provide nondestructive physical characterization of internal features and structures of a part or component. Industrial CT scanning is able to access internal data equally well on metallic and nonmetallic specimens, solid and fibrous materials, and smooth and irregularly surfaced objects. Generally, there are two basic types of medical and industrial CT scanners. There are parallel x-ray beam scanners and fan x-ray beam scanners. 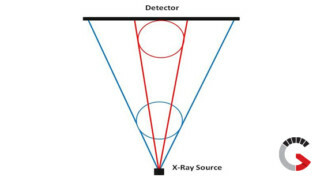 Parallel x-ray beam scanners can be categorized into first and second generation systems, similarly fan x-ray beam systems are categorized into third and fourth generation systems. These different types of CT scanners have been named according to their method of data collection, as opposed to the shape or structure of the beam itself. Pencil Beam Systems—The x-ray beam is collimated to a pencil and the effective pixel size becomes the size of the beam on the detector area. The beam is translated over the object and the object rotated after each pass of the beam over the object or the beam and detector are translated and rotated around the object to build up linear slice profiles. If a three dimensional data set is desired the object or beam/detector must elevate so that multiple slices are generated. The advantage of this method is detector simplicity and scatter rejection with the primary disadvantage being long scan times. Fan-Beam Systems—The x-ray beam is collimated to a fan and detected by a linear detector array that usually has a collimator aperture. The pixel size is defined by the width of the fan-beam on the detector height (vertically) and by the detector element pitch (horizontally). Linear profiles are captured as the object or beam/detector rotates. If 3D data is required, the object or beam/detector must elevate to capture multiple slices. The advantage of this method is faster scan times than pencil-beam systems and some scatter rejection with the primary disadvantage being long scan times for 3D data. Cone-Beam Systems—The x-ray beam is usually collimated to the entire or a selected portion of the active area of a two dimensional detector array and full 2D images are captured as the object or beam/detector rotates. In this manner multiple slices are generated without needing to elevate. The primary advantage of this technique is speed or acquiring 3D data, with the primary disadvantage being increased scatter due to larger field of view. Translate-Rotate Motion—The object or detector is translated in a direction perpendicular to the direction and parallel to the plane of the X-ray beam. Full data sets are obtained by rotating the object between translations by the fan angle of the beam and again translating the object until a minimum of 180° of data have been acquired. The advantage of this design is simplicity, good view-to-view detector matching, flexibility in the choice of scan parameters, and ability to accommodate a wide range of different object sizes, including objects too big to be subtended by the X-ray fan. The disadvantage is longer scan time. Reconstruction software must correctly account for fan/cone beam effects which can be complicated by translation of the object. Electrical X-ray generators offer a wider selection in peak energy and intensity and have the added safety feature of discontinued radiation production when switched off. Filtering of the x-ray beam can “Harden” the x-ray spectrum by reducing the amount of lower energies which can help reduce artifacts. Harder beam spectrum results in lower image contrast and may need for higher primary beam exposure dose, therefore, selection of the correct filtering is very important. X-ray tubes and linear accelerators (linacs) are typically several orders of magnitude more intense than isotope sources. However, X-ray generators have the disadvantage that they are less stable than isotope sources. X-rays produced from electrical radiation generators have source spot sizes ranging from a few millimeters down to a few microns. Reducing the source spot size reduces geometric unsharpness, which enhances detail detection. However, the basic spatial resolution of the detector must also be able to support this increased spatial resolution. Smaller source spots permit higher spatial resolution but at the expense of reduced X-ray beam intensity. 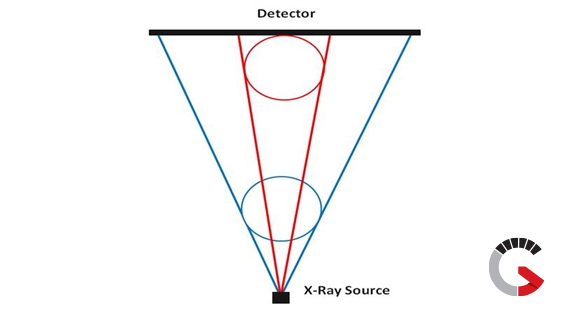 Reduced X-ray beam intensity implies longer scan times or inspection of smaller or less dense objects. Unlike radiography, an industrial computed tomography scanner can require extended, continuous usage of the X-ray generator so an increased cooling capacity of the X-ray source is required. Isotope Sources—A Isotope source can have the advantages of small physical size, portability, low power requirements, simplicity, and stability of output. The disadvantages are limited intensity per unit area, limited peak energy, and increased regulatory/safety concerns. Synchrotron Radiation (SR) Sources— Synchrotron radiation (SR) sources with special equipment produce very intense, naturally collimated, narrow bandwidth, tunable radiation. CT systems using SR sources can employ essentially monochromatic radiation. With present technology, however, practical SR energies are restricted to less than about 20 to 30 keV. Since any industrial CT system is limited to the examination of samples with radio-opacities consistent with the penetrating power of the X rays or gamma rays employed, monochromatic SR systems can, in general, image only small low density objects. The role of Spot Sizes—The source spot is the source region from which X rays or gamma rays emanate. In an electrical radiation generator, like an X-ray tube or linear accelerator, it is the area where the electrons strike the target. The size and shape of the source spot is an important determinant of the aperture function. For instance, source spots in linear accelerators are typically shaped as curved; whereas source spots in X-ray tubes are often double-peaked. Since source spots do not generally have sharp edges—or even symmetric shapes, it is common practice to define an effective size for convenience. The actual intensity distribution is important information, but is too complex to be readily useful. Consequently, reported source spot sizes are a function of the definition and method used to measure them. The average radius of the region from which 99 % of the emissions emerge will be much larger than the standard deviation of the intensity distribution. In other words, source spot characteristics can be quantified in different ways. For this reason, comparisons between sources, especially those provided by different suppliers, are difficult to make. Another source factor to consider is stability. In selecting an electrical source, appreciate that spot position can wander over time, and changes in accelerating potential can change the size as well. A potential drawback with CT imaging is the possibility of artifacts in the data. An artifact is anything in the image that does not accurately reflect the true geometry in the part being inspected. Because they are not real, artifacts limit the user’s ability to quantitatively extract density, dimensional, or other data from the image. Therefore, as with any technique, the user must learn to recognize and be able to discount common artifacts. Some image artifacts can be reduced or eliminated with CT scanning by improved scanning practices, and others are inherent in the methodology. The reconstruction problem places a number of severe constraints on the data. Since the presence of random noise corrupts the information, one would expect the minimum sampling requirements to be greater than they are for noise-free data as well as to be sensitive to the algorithm employed.